Covering an area of 235,000 meter sq. and occupying a volume of over 2 million cubic meters, the Royal Palace of Caserta is the largest royal residence in the world. A luxurious site world famous for its lavish displays of Baroque, the palace was completed in the late 18th century and has baffled visitors since. Spread over 5 floors which house 1,200 rooms, the palace has been featured in several film shoots including Star Wars, Angels and Demons and Anzio. The palace is also known for its parks and landscaping. With fountains and cascades spread around the complex, the palace vistas rival those of Versailles and Madrid. The Palace is also famous for its artworks and decor. Frescoes on the walls and intricate carvings and statues over the garden are just half the story. The Terrae Motus Collection is a must visit within the palace. Featuring over 70 works of contemporary artists, the collection was put together after a devastating earthquake rocked the region in 1980. You can also indulge in fine dining experience or enjoy a picnic in the park at the palace. An ideal visit for families and history enthusiasts, this is an experience which you just can’t miss out on. If the saying, ‘the bigger the palace, the bigger the king’ was true, then the Bourbons of Naples could be considered the overlords of the lands. Step inside their extravagantly furnished home and be baffled by an enormous collection of paintings, drawings, frescoes, books, bronzes, and other objects all around the Royal Apartments. 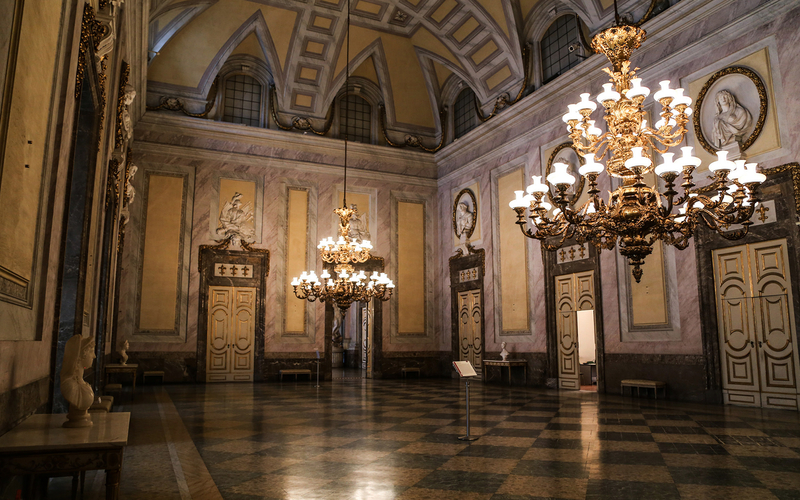 Be sure to visit the Grand Staircase of Honor, the neo-classical Royal Palatine Chapel, the spectacular horse-shoe shaped Royal Court Theatre, the inspiring Terrae Motus Collection and another picture gallery showcasing paintings which date back to the 16th century AD. There’s plenty for you to see and explore; be sure to not miss any of it as you delve in the luxurious riches of the Bourbon Kings. And this is just in the Royal Apartments! There’s also the small matter of the massive 120 hectare park. Designed using an innovating ‘telescope effect’, the park is a beautifully designed space full of fountains, statues and greenery. Check out the French-inspired ‘Parterre’, the majestic Fountain of the Three Dolphins, the godly Fountain of Aeolus and Fountain of Ceres, and many more wonderful cascades. You can also visit the fascinating English Garden, the charming San Leucio Belvedere, the Carolino Aqueduct and discover the wildlife sanctuary at San Silvestro Oasis. The options are endless and there’s a lot for you to take in. At the end of it all, you’ll be left speechless and spellbound at what you’ve witnessed. The palace offers a few dining options if you get hungry on your visit. There’s a restaurant inside the palace and a takeaway kiosk near the English Garden entrance. Free checkroom service is available at the entrance of the Royal Palace. You will not be allowed to take strollers, bags, umbrellas, backpacks or any other large items inside the attraction. 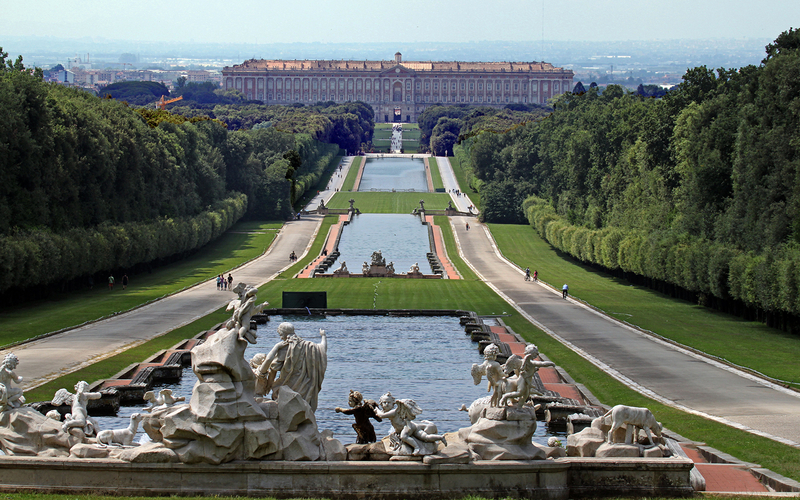 You will receive an email with your Royal Palace of Caserta- Skip The Line ticket voucher shortly. You don’t need to take a print of this. Just show the voucher on your mobile device along with a valid photo ID at the ticket redemption point. - By Train: From the Napoli Centrale Station take a train to Caserta. The train stop in Caseta is directly in front of the Royal Palace - By Bus: From the Naples Central Bus Station at Piazza Garibaldi a bus leaves Caserta every 15 minutes. The bus stop at Caserta is within walking distance of the palace.